Vaneshwar Shiva Temple in Mainpuri in Uttar Pradesh is witnessing a strange event for the past 50 years. The Shivling worshiped in the temple is moving towards the main temple door. 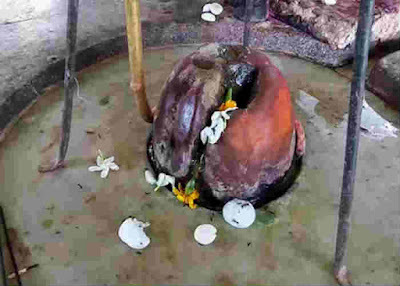 Shivling in most temples in North India is located under a water pot. The Shivling here has moved nearly 2 feet away from the pot. Elders in the village of Nagaria, where the temple is located, state that earlier the Shivling was exactly below the water pot. Then there was a big drought in the region. People performed prayers here but there was no rain. The pujari of the temple got angry and hit the Shivling with an axe. The Shivling started moving from that day onwards. Villagers believe that the day the Shivling comes out of the temple door, it will signal the end of the world through deluge as mentioned in Hindu scriptures. It is said that the Shivling had reached the door of sanctum sanctorum many times and then it returned to its original position. The temple attracts a huge crowd during Shivratri. The other auspicious days include Monday, Pradosh, and Chaturdashi. Shravan month is observed with great enthusiasm here. People arrive with pots of water to perform abhishek on the Shivling. Devotees have had their wishes fulfilled after offering prayers here.